(by Emily Schultheis, CBS News) — After the first four voting contests of 2016, a clear trend is showing up in the numbers: compared with 2008, Democratic turnout is down, while Republicans are hitting record turnout highs. In South Carolina’s Democratic primary, for example, where Hillary Clinton scored a big victory Saturday night, just over 367,000 people turned out to vote–a 30-percent decrease from 2008, the last contested Democratic primary, when 532,000 Democrats voted. Just a week earlier, when Republicans in South Carolina went to the polls, a whopping 738,000 turned out, over 20 percent more than the 603,000 Republicans who voted in 2012 in the GOP’s last contested primary. The picture is similar across the board. In Nevada’s caucuses, 84,000 Democrats turned out to vote–a nearly 30-percent drop from 2008, when 118,000 Democrats caucused. In New Hampshire, just over 250,000 Democrats turned out, compared with 288,000 in 2008 (a 13-percent drop). In the Iowa caucuses, turnout fell from about 240,000 to just over 171,000 (a decline of just under 30 percent). On the Republican side, it’s the opposite: turnout in the first four contests has been record-breaking. In New Hampshire, GOP turnout was up about 14 percent over 2012 (284,000 people voted this year, compared to 248,000 in 2012). In Iowa, more than 186,000 Republicans caucused, a more than 50-percent increase over 2012’s 121,000 GOP voters. In Nevada, a record-breaking 75,000 Republicans caucused, compared with just 33,000 in 2012 [an increase of 127%]–in fact, more people cast a vote for Donald Trump — just over 34,000 — than voted in the entire 2012 caucuses. Strong turnout is typically a sign of how enthusiastic and engaged a party’s voters are, a point Republicans are driving home as they tout the GOP’s record turnout. And generally, a party’s primary or caucus turnout is higher when its voters are engaged in the process and the race is competitive–both of which are true on the Republican side. …..
Democrats have a contested primary, too, but with just two candidates–and despite Sanders’s victory in New Hampshire, his candidacy hasn’t been able to bring in the kind of new, first-time voters that then-Sen. Barack Obama’s did in 2008. Still, lower Democratic turnout doesn’t necessarily mean the party’s voters aren’t paying attention, or that they won’t show up in November. On the Democratic side, 2008 was a historic election–and Democratic Party officials say it was always unlikely they’d be able to match it again, even with a contested primary between Clinton and Sanders. .…. For Democrats, low turnout has hurt Sanders’s campaign–a fact he acknowledged after the Nevada caucuses. Like Obama, he needs to grow the electorate and bring in new people in order to be successful, and it’s unclear whether he’ll be able to do that going forward. 2. What trend is clear from these turnouts? 3. 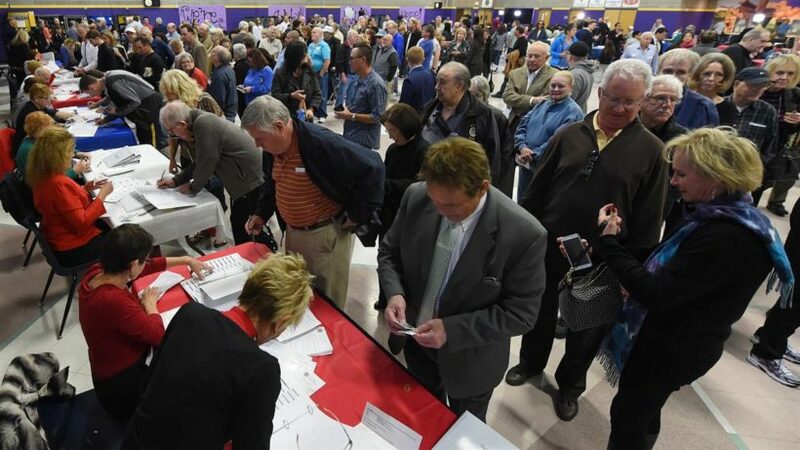 What is significant for Republican voter turnout in Nevada? 4. What is strong voter turnout in primary elections a sign of? 5. a) Define contested primary. b) If the president is not running again, the party generally will support the vice president’s nomination if he runs. Vice President Joe Biden has declined to run. Gallup reported in 2014 that young adults (those between the ages of 18 and 29) have typically aligned themselves with the Democratic Party, but they have become substantially more likely to do so since 2006. Consider the fact that the Republican party had several candidates in their 40’s, a woman, an African American and two Latino candidates. Bernie Sanders is 74. Why do you think no younger Democrats entered the race against Hillary Clinton (except Maryland Gov. Martin O’Malley, who never received any substantial support)? If elected, Hillary Clinton would be the first woman president. Many Democratic women say they are voting for her for that fact. Do you think the possibility of electing the first female president should have resulted in higher voter turnout or do you agree with Mr. McDonald? Explain your answer. The reporter states “it’s tough to know for sure which party the increases are coming from” – do you agree? Explain your answer. 9. Do you think the large number of Republican candidates hurt the party’s nomination process? Explain your answer.